Also available in 24V 80A and 48V 40A versions. A professional standard charging method. The first part of the charging is with constant current. It lasts until the voltage has increase to 14.4V. Then the charger swithched to constant voltage charging. During this period, the voltage is stabilized at 14.4 V and the current is decreasing slowly. 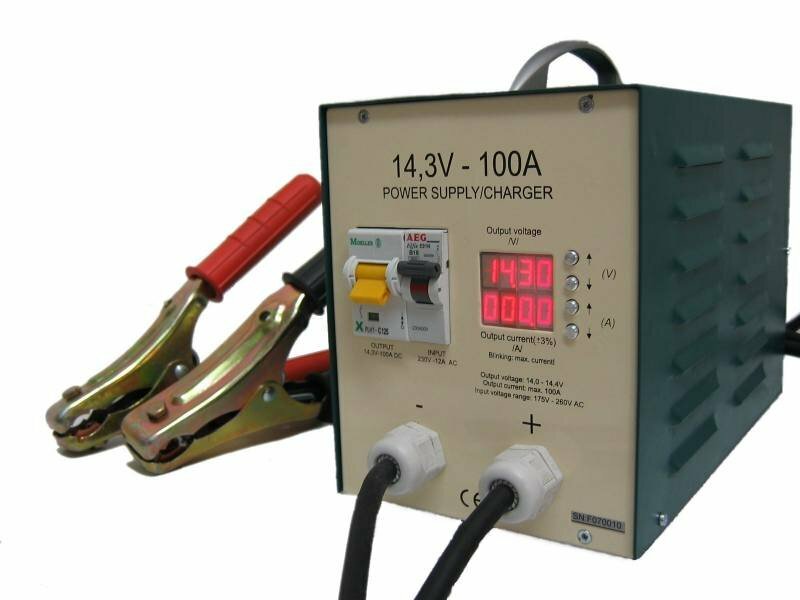 When the current has decreased to 1.5A � 2A, the charger reduces the voltage to 13.6V. This constant voltage 13.6V will last as long as the charger is turned on. Useful for in system charging where some loads turned on and off in the meantime. If the current reaches the current limit, a 10(optional) second timer is starting. If the charger still be in current limit, it starts charging continuously, and when the current decrease below the current limit starts a 12hours(1-24h optional) constant voltage(14,4V, optional) charging period. After this period the charger reduces the voltage to 13.6V. This constant voltage (13.6V, optional) will last as long as the charger is turned on. If the current limit drops before the 10 second timing ends, the charger performs a 10(optional) minutes 14,4V charging, and then reduces the voltage to 13,6V. Protected against short circuit, sparking and overheat.